A French museum has won a bidding war for an unpublished Charlotte Bronte manuscript, dashing hopes that it could return to the author's former home. The Musee des Lettres et Manuscrits in Paris bought the second issue of Young Men's Magazine at auction for £690,850. It outbid the Bronte Parsonage Museum, based in the family's former house in Haworth, West Yorkshire. The work, written when Bronte was 14, is regarded as important for the light it sheds on her literary development. The miniature manuscript, dated 1830, smashed its pre-sale estimate of £200,000 - £300,000 and set a new auction record for a manuscript by any of the Bronte sisters. Charlotte Bronte, best known for Jane Eyre, created six hand-written editions of the magazine as part of an imaginary world she built with her famous sisters and her brother. The issue sold on Thursday contains a story that is a precursor to the famous passage in Jane Eyre in which Mr Rochester's insane wife, who is kept in the attic, seeks revenge by setting fire to his bed curtains. Dr Philip Errington, director of books and manuscripts at auction house Sotheby's, said the work, which contains over 4,000 words on 19 pages, had "huge literary significance". "This tiny manuscript represents her first burst of creativity and provides a rare and intimate insight into one of history's great literary minds," he said. The Bronte Parsonage Museum already owns four of the six copies of the magazine. The whereabouts of the remaining edition are unknown. The museum was awarded a grant of £613,140 by the National Heritage Memorial Fund to buy the artefact, as well as receiving a number of smaller donations. But it was not enough to secure the book, which will now go on display in Paris in January. Andrew McCarthy, director of the Bronte Parsonage Museum, said it was "the most significant manuscript to come to light in decades". Author and Bronte Society president Bonnie Greer said the book "puts down in luminous prose not only the daydreams of a little Yorkshire girl, but it also contains the seed of the work of one of the greatest writers in the English language". Media captionAndrew McCarthy, director of Bronte Parsonage Museum: "Very disappointed. The outcome is clearly not one that we would have hoped for"
"It will not be going home, back to the place where it all began, the Parsonage at Haworth," she said. "Its presence there would have placed it not only at the heart of the proud community in which she was born and raised, but would have brought full circle a Yorkshire story, a northern story, a British story, a world story." 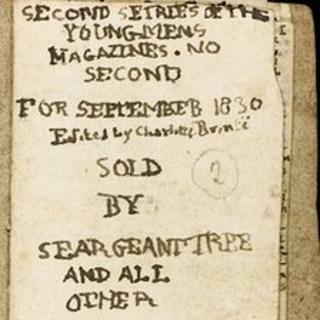 The Young Men's Magazine Number Two was sold by an anonymous private European collector.